All sports activities have a risk of oral facial injuries due to balls, collisions, and contact with hard surfaces. To prevent your child from the ill effects of these injuries you can easily get a mouth guard made for him at Wisdom Dental Clinics. A custom made mouth guard is individually designed and constructed in the dental office or laboratory. 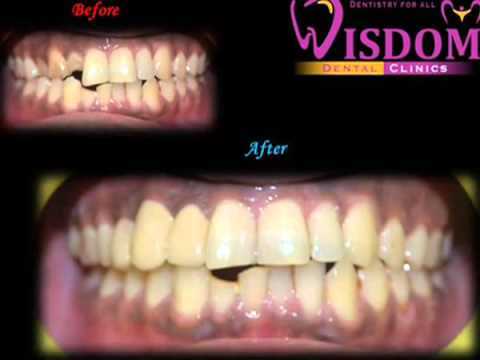 A custom-made mouth guard fits well and does not interfere with speech or breathing.At Wisdom Dental Clinics we offer dental care procedures related to minor or major sports injuries contracted mainly during contact sports. Sports Dentistry aims at prevention and treatment of oral/facial athletic injuries as well as diseases.It is generally believed that nearly 80% of all injuries are preventable. Participation in exercise and sport whether positive or negative, will always remain a major consideration in the health of a national population. Participation in sports competitions brings the challenge to maximize the benefits and to limit injuries. Sports dentistry has a major role to play in this area. Prevention and adequate preparation are the key elements in minimizing injuries that occur in sport. It is always better to have the insurance of custom (dentist) made mouthguards. Parents should enourage their young kids to wear mouthguards in sports participation. Sports bodies should also make it mandatory to wear this important protective teeth gear. In a good numbers of competitive sports, particularly the contact sports of Cricket, football, boxing, martial arts, Kabbadi and hockey, it is essential to take injury prevention measures through properly fitted mouthguards. Several other non contact sports like basketball, baseball, bicycle riding, roller blades, soccer, and wrestling, racquetball, surfing and skateboarding also require properly fitted dental mouthguards, as dental injuries unfortunately, are a negative aspect of participation in these sports.